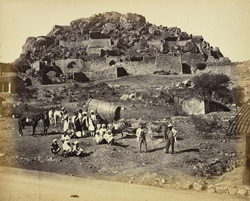 Photograph of the interior of the Fort at Chitradurga, taken by Henry Dixon around 1868, from the Archaeological Survey of India Collections. The hill fort at Chitradurga is situated in a rocky landscape north-west of Bangalore. The fortifications were built by the Naiks Pallegars in the 17th century. In 1779 Haider Ali captured the mud fort and erected a stone fortress. This Kallina Kote or Palace of Stone has many massive gateways with bent passageways, a palace, a mosque, granaries, oil pits and water tanks. Inside the fort complex there are fourteen old temples; the Hidimbeshwara temple is the oldest temple on the site. This is a view looking towards the walls and fort buildings on the hillside, with two Europeans, bearers and servants posed in the foreground.